Auto-scaling, topic and preference -targeted, adblocker-resistant campaign delivery. Individual campaign slots can show different media based on screen size, topicality of content and user preferences. All served up from the core system and indistinguishable contentc, media and code-wise from other non-promotional content. Affino's Campaign system is totally at one with the core site experience - in coding terms - indistinguishable from other content and media. Meaning you can target a much larger audience and achieve a significantly higher rate card. Because of its integral nature and targeting abilities, it can be synced with navigation and channel / article topics or be served up based on User's registered preferences. 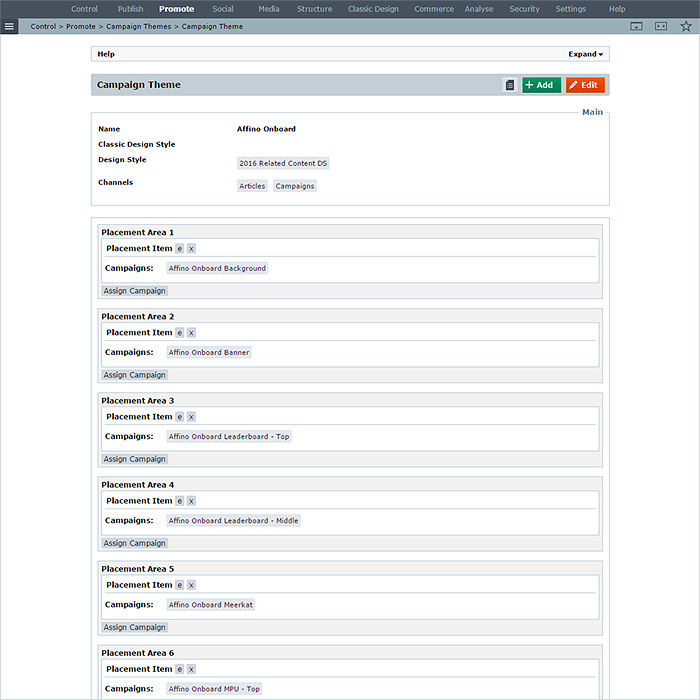 You can also apply an additional permissions layer to target different streams of logged-in users.